Simple yet elegant, thistles have long been the floral embelm of what was once the Kingdom of Scotland. As a matter of fact, the Scottish Thistle is the oldest recorded National Flower and is probably one of the most well-known and easily recognized symbols of Scotland today. The characteristics of the flower holds symbolism from more than one perspective. The flower itself is a symbol of an enlightened person – a person who has gained their crown. Because the flower head is purple, there is added power in its symbolism. The color purple has long been a sign of royalty, high rank, justice, wealth and dignity. The thistle is also an ancient Celtic symbol of nobility of character and birth. 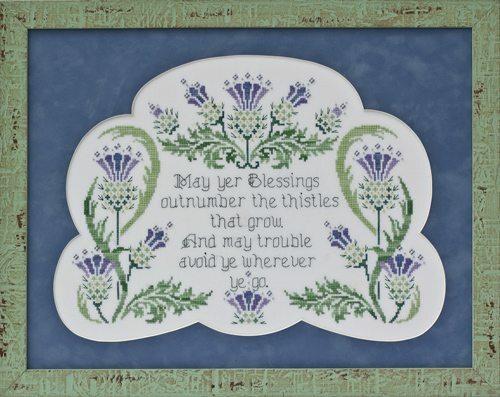 Taken from an old Irish Blessing about shamrocks, the designer has modified this blessing as a tribute to Scotland and the mighty thistle. Fabric: Stitched on 28ct White Jobelan provided by Wichelt Imports, Inc. Suggest purchasing a fat quarter (18″ X 26″). Glendon Place does not offer this fabric on the website simply because white is such a common color and it can be stitched on just about any fabric, to include: Jobelan (or an evenweave), Linen, or Aida. Materials Summary: Uses 6 colors of Dinky Dyes hand-dyed silk floss, 4 colors of Mill Hill Beads, and 2 colors of Sullivans USA/Anchor/or DMC floss for attaching beads and backstitching the wording. Comparable Sullivans/DMC/or Anchor colors are not provided for this design.